My mom, thrifter, DIY guru, and now blogger, found 100% wool, farm grown quilt batting at a garage sale a few summers ago for $2. She gave it to me and it lived in my basement for a while before I used it in a quilt. I pulled a random selection of pink and green scraps and made a charm square top channeling Posy Gets Cozy's projects to the best of my ability. 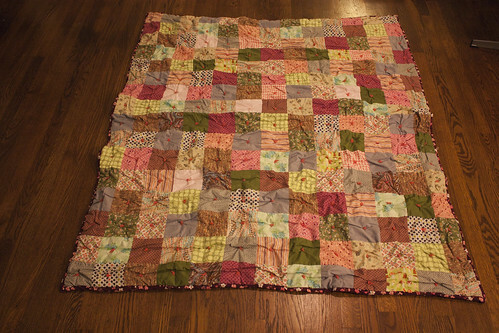 I wanted a really vintage looking quilt and I thought this style would pair well with thick wool batting. Basting the quilt was quite the adventure because the batting was so lofty. At some points, it was about two inches thick. 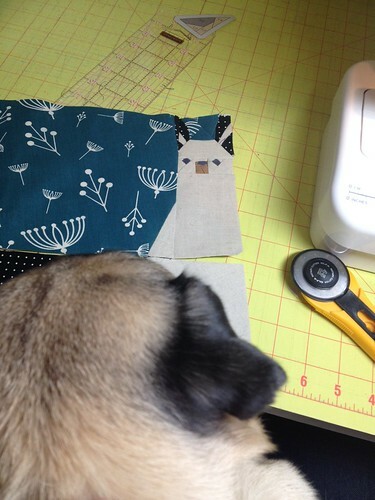 I originally wanted to quilt diagonal lines with my sewing machine's walking foot. After I attempted one line, I realized that it would cause too much puckering and would be difficult to fit through the throat of my machine. I changed things up and used some leftover worsted weight wool yarn to tie the center of each square. (Hint: if you use a long enough piece of yarn, you don't have to re-thread the needle for each square!). 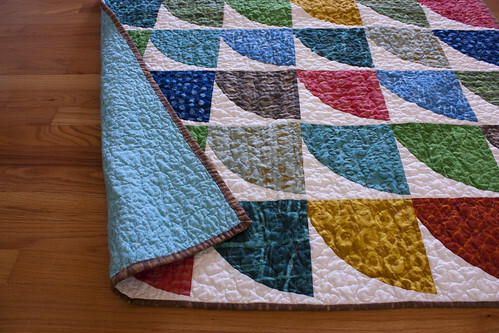 Here's a great tutorial for tying a quilt that I wish I had seen before attempting this sans directions. After it was tied, I added a double fold binding. 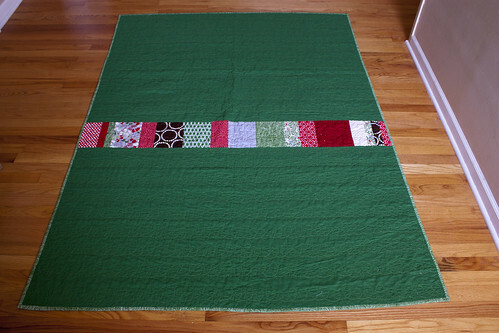 I ended up having to use 4.5" wide strips for the quilt because the batting was so thick. I tempted fate by using the gentle wool wash cycle on my front loader and everything came out great. 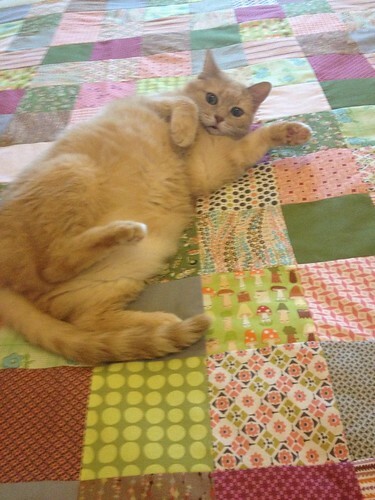 Then I laid the quilt flat to dry for a few days. 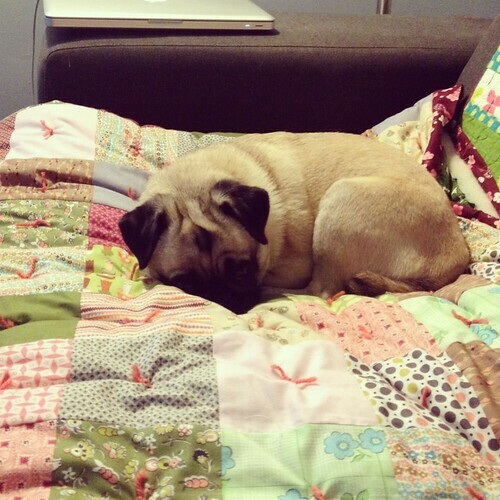 This turned out to be the heaviest, warmest, coziest quilt I've ever made and we always have to share it with Koko and Nuku Nuku. A couple weeks ago, it was starting to look and smell a little bit too much like fur for my taste, so I threw it in the wash. For some reason, I wasn't thinking when I threw it into the dryer for a few minutes to fluff it up. After 5 minutes in the dryer, I pulled it out only to find that it had shrunk significantly. This was so disappointing! 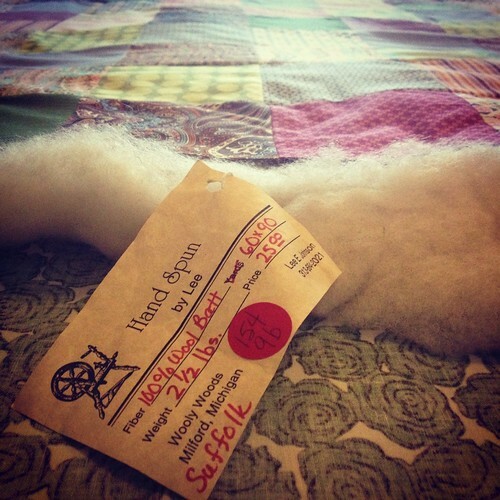 Now I have a super puckery, felted wool quilt. I can't believe I was so careless, especially after always treating my handknits so kindly. 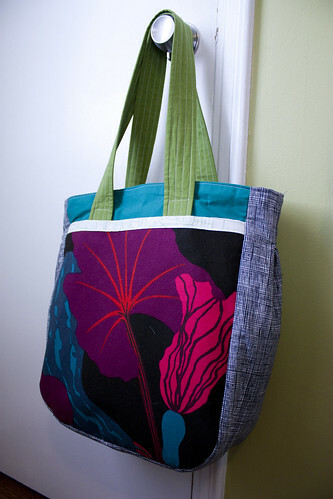 I first learned about the Super Tote pattern after seeing Sarah's in person. 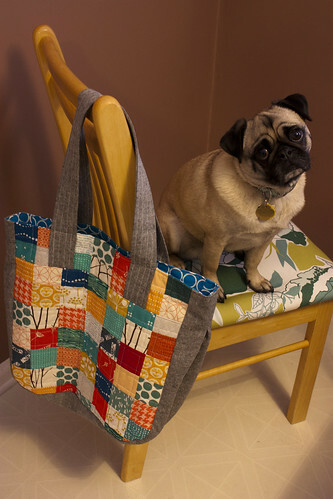 I still kind of want to steal Sarah's bag because I am smitten with the typewriter fabric she used! I made my first version based around a Marimekko print I've been hoarding for a few years. I made a few changes to the pattern, including eliminating the inner zip pocket and outer magnetic closure, and adding bias tape along the outer pocket instead of piping. I was happy with everything about this bag, except the inner pockets. As written they were too flimsy and didn't have any extra lining or interfacing. In my next version, I folded the pocket fabric in half (right sides showing) when cutting out the pattern piece, ironed on interfacing to the inside of the pocket fabric and then followed the pattern as written. 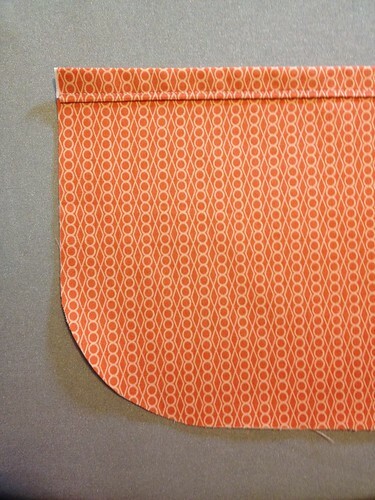 The pocket is now lined and is much sturdier. My second version came about during an evening of stash folding. 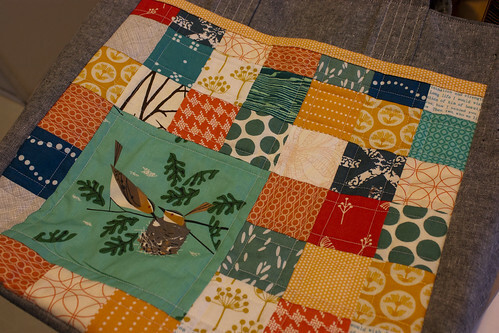 I pulled out this cute Charley Harper fabric and created a 2x2 grid of patchwork based on the focal bird print. I quilted the front pocket and the back bag panel before following the instructions as written. 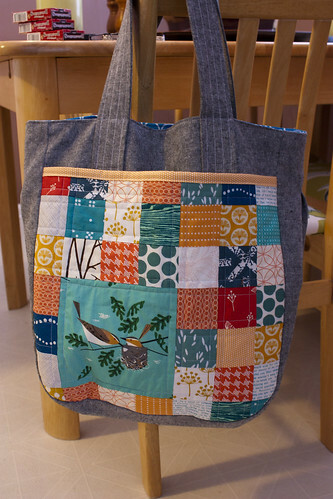 I was able to give this bag to my dear friend, Catherine, on her Christmas break visit from Germany. 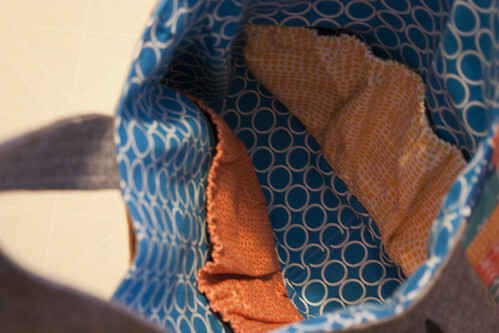 She's a science teacher and has lots to lug around, so this bag fits the bill perfectly! 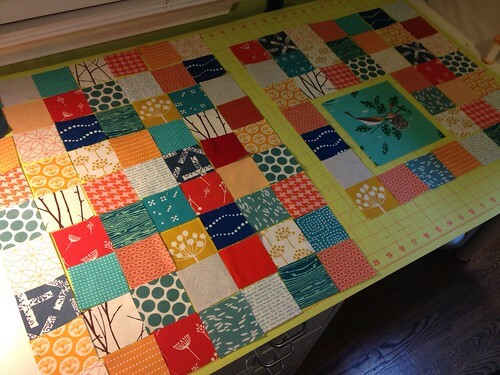 Now I'm considering making a giant 2x2 patchwork quilt because I love the look of all these fun prints together. 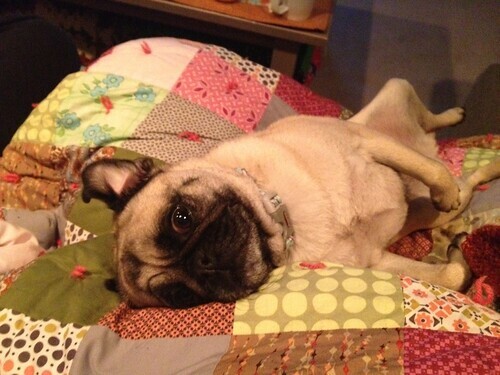 Last August, Sarah (of Hip to Piece Squares) and I headed to Grand Rapids for the AQS Quilt Show. I wanted to go to see all the pretty quilts on display....but we managed to spend our entire afternoon shopping and didn't make it to any of the quilts in the show (big oops!). The highlight of the show had to have been meeting Bill Kerr and Weeks Ringle of Modern Quilt Studio in person. 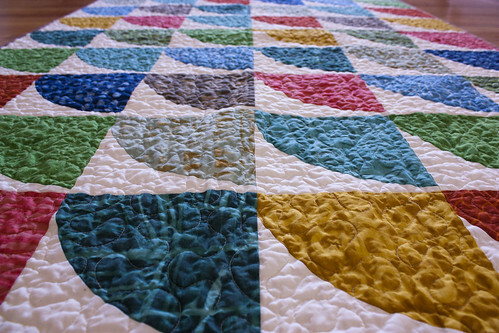 Their book, The Modern Quilt Workshop, was the book that inspired me and taught me how to quilt back in 2006. I love their simple aesthetic and clean designs and my Plain Spoken Quilt is one of my all-time favorite projects. Shopping at their booth that afternoon flipped the switch for me and I've been on a quilting bender ever since then. 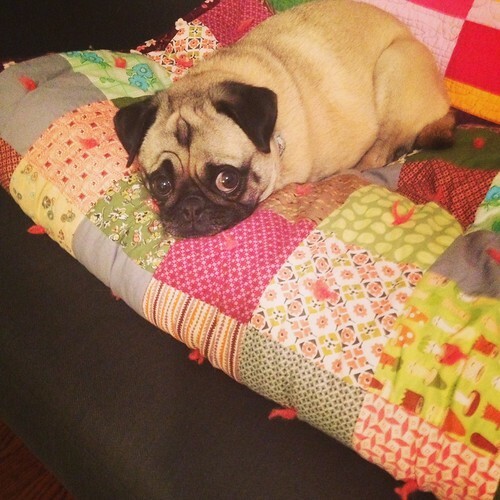 I purchased the Snowdrift Quilt Kit along with a few of their magazines. 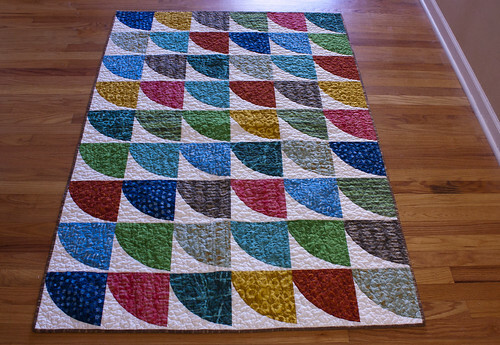 The quilt kit sat on my shelf for a few months while I mustered up the courage to tackle curved piecing. I ended up pulling out the kit and making a last minute Christmas gift for Jon's grandma (bonus: curves no longer scare me). 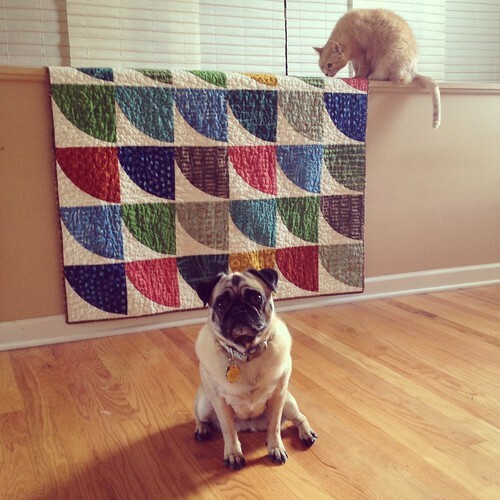 She's been hinting at wanting one of my quilts for many years now and the colors in this kit just happen to match her living room, so it was clearly meant to be. 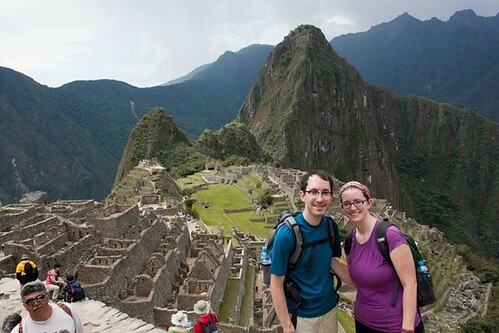 In September 2012, Jon and I spent 10 days traveling around Peru. 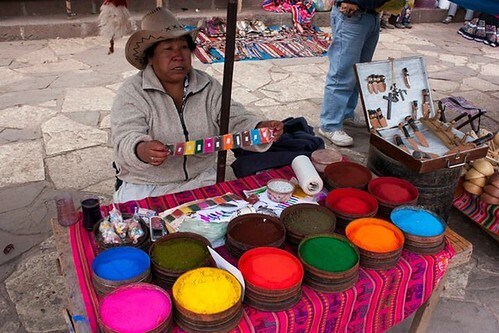 We landed in Lima and then travelled to Cusco, Machu Picchu, Puno and Lake Titicaca. 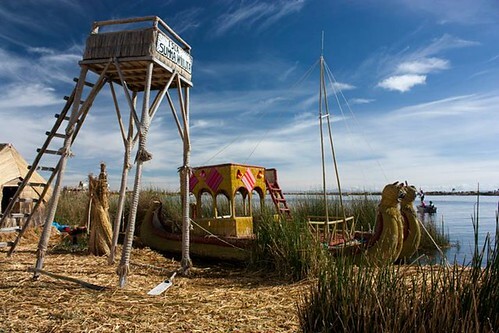 The scenery was absolutely breathtaking as Peru is known for having 28 of the 32 different microclimates in the world. 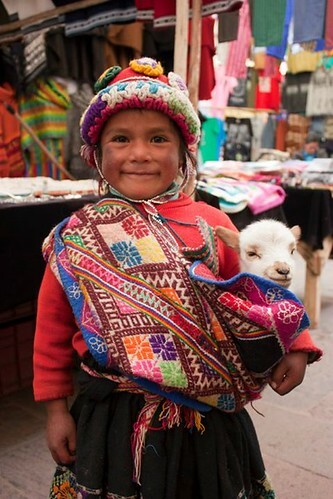 We were enamored by all of the artisans we saw. 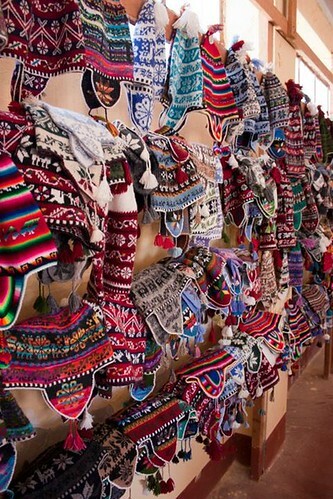 Weavings, hand knits, hooked rugs and dyes were available for sale. 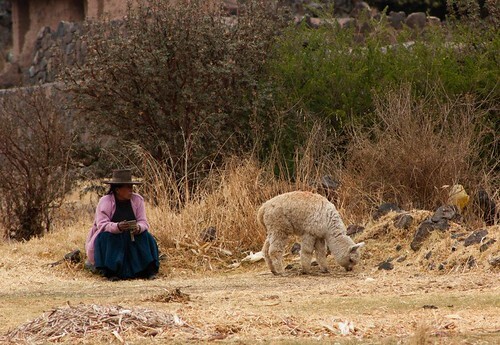 Of course, we loved seeing an abundance of sheep, alpaca and llamas. 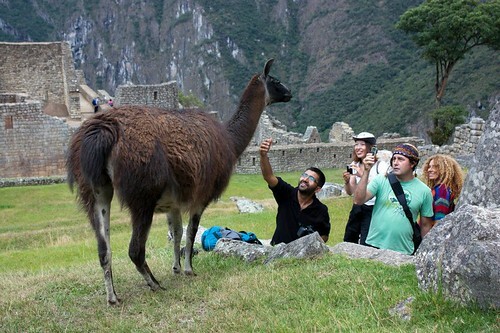 We quickly learned that photo ops like these were one of the top tourist traps. 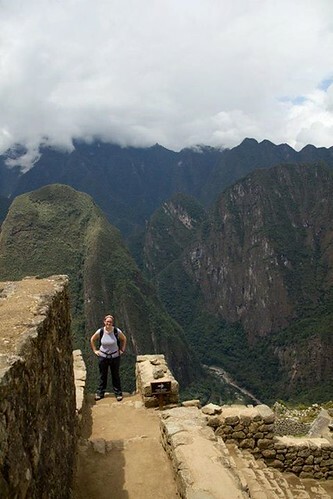 We spent two days exploring Machu Picchu and attempting to overcome our fear of heights with lots of hiking mountain climbing (it didn't really work!). 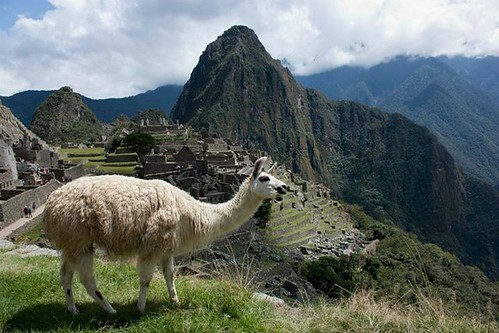 The actual site of Machu Picchu is surrounding by the Andes Mountains and makes it feel really intimate. 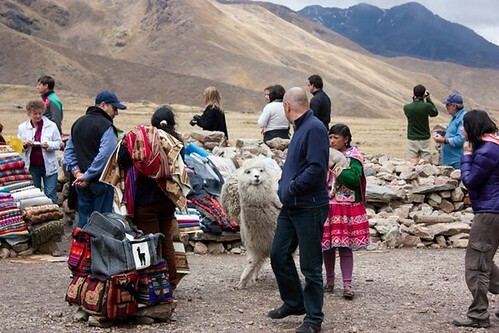 We pretty much spent our second day stalking the llamas on the site. They are so cute! 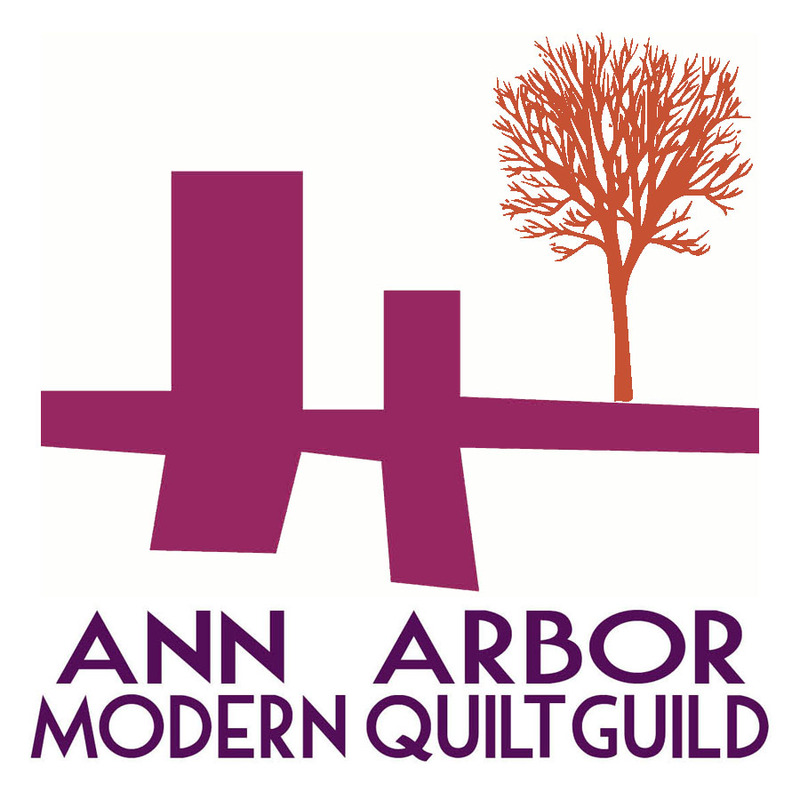 Lauren, from the Ann Arbor Modern Quilt Guild, wowed us all with her intricate llama paper piecing at our November meeting. There was a loud gasp from all the members as she held it up during show and tell. 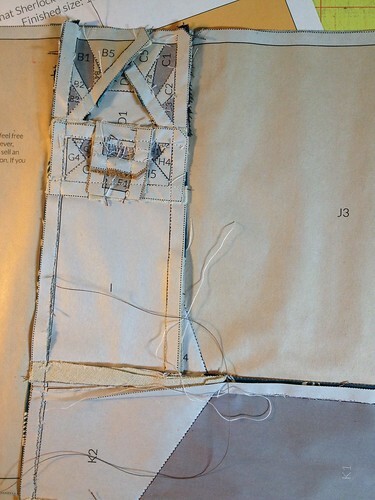 I had never really heard of or understood paper piecing before, but her project gave me the impetus to learn! 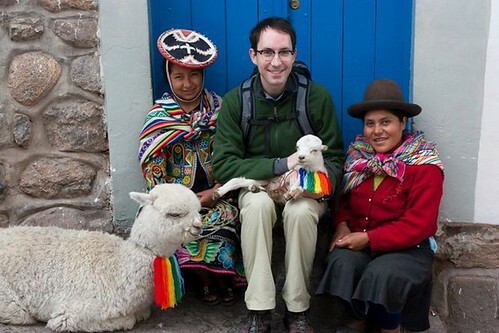 The pattern is Leonard the Llama from Sew What Sherlock. 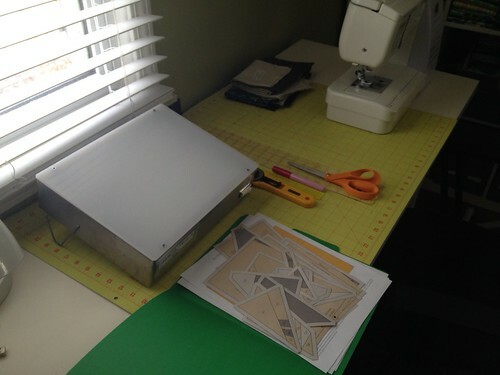 I set up my sewing table with my light box, glue pen, add-a-quarter ruler and iron and ironing board and got to work. It was overwhelming at first, but once I focused on a small piece at a time, it came together during a day off from work. 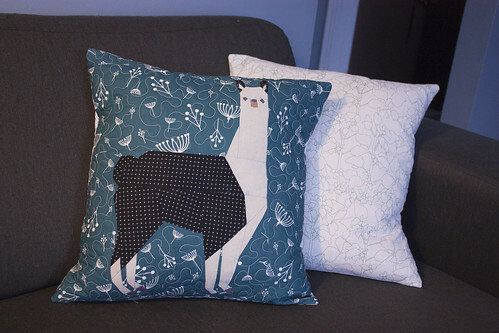 I free motion quilted around the llama and turned this into an envelope pillow case for our newly acquired down pillow forms from Ikea. 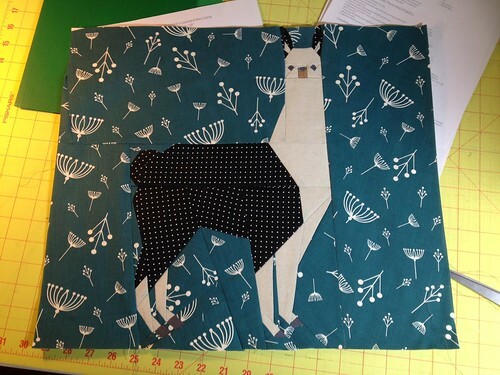 I backed it with this llama fabric from Laurie Wisbrun. In addition to the llama, I made a contrasting pillow with some new Botanics fabric quilted in a random grid pattern. 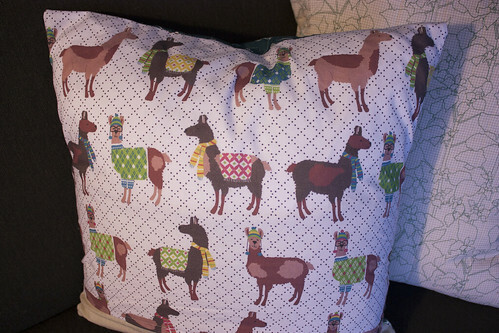 It's nice to have some fun new pillows that remind us of our trip to Peru! In December, I went into hyper Christmas crafting mode. 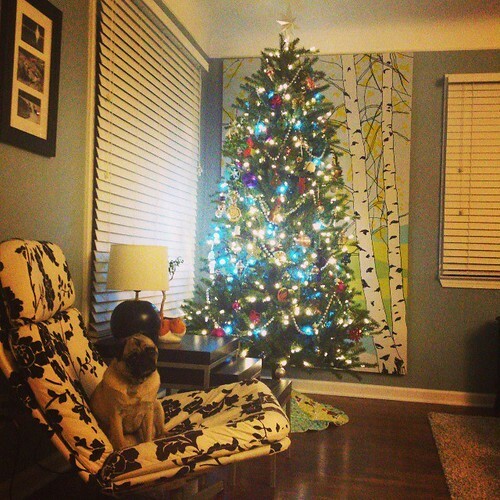 Kitschy Christmas fabrics are a favorite of mine, so I used lots of fun fabrics to spruce up our house. 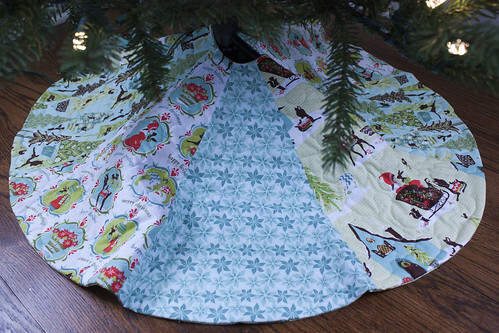 This tree skirt was actually one of the few sewing projects I finished in 2012. In a moment of weakness, I caved and bought a half yard set of these (maybe Michael Miller?) prints. I love the cuckoo clock and the vintage Christmas carolers on these. We have a trim line tree and most skirt patterns are too large in diameter, so I made a giant compass to trace out a circle in the perfect width. Then I divided the circle template into 8 sections and cut two of each print. I backed it with extra fabric, did an envelope binding and quilted the outside. I tied brown grosgrain ribbon to each side of the opening to tie it in place. I totally fell in love with this gingerbread print this year. I didn't want to chop it up for patchwork, so I used it to edge the bottom of these kitchen towels. 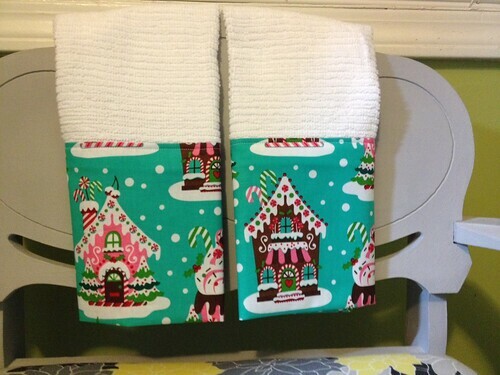 If I were to do this again, I would definitely prewash both the fabric and the towels before sewing them together. It takes a lot of ironing to get them to look decent now. 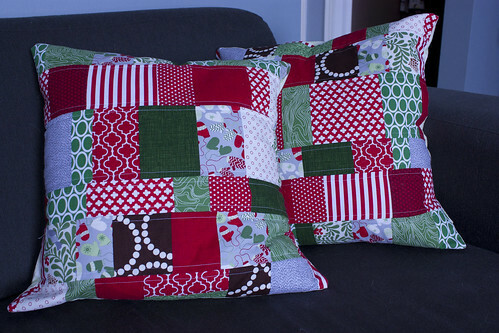 After several years of quilting, I finally got my act together and made a Christmas quilt and pillow set for our living room. I've been meaning to do this forever and I'm so glad things finally fell into place. I actually finished this up the day after Thanksgiving and we got to enjoy it all season long. 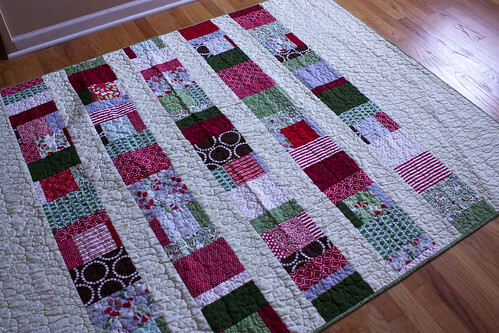 The main inspiration came from a Christmas bundle at Pink Castle Fabrics. I added a few other red or green prints and a charm square pack of In From the Cold by Kate Spain. 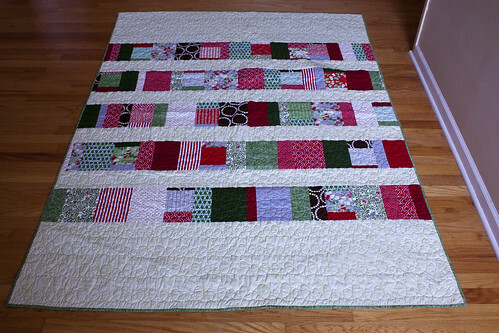 I sewed together patchwork strips and then alternated those with a low volume spring green floral print. 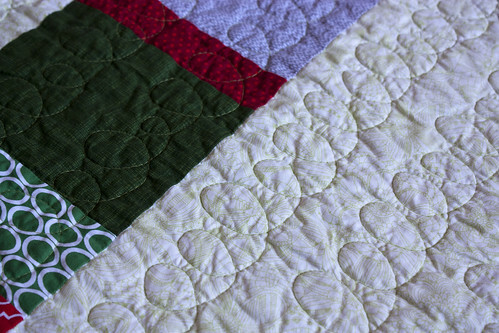 I used up almost every last bit of those fat quarters and even included a strip on the back of the quilt. 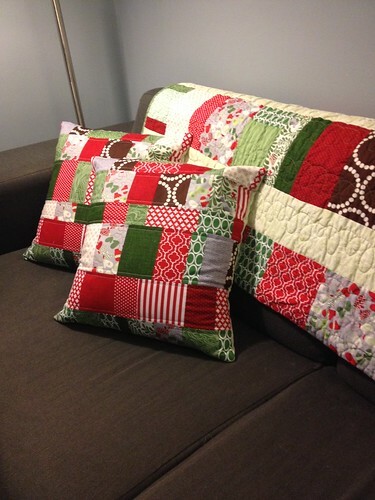 For the pillows, I sewed several strips together and then I cut them in half at different widths. Both pillows have the same order and progression of fabrics, but the heights of each row are different.